Back in the misty mists of time when I was a teenager, I used to commute to school as my parents decided to move out of London and I wanted to keep going to the same school so I took a train every day. As a result, all my friends were up in London and I also had a Saturday job so every weekend I would again take the train to London to work in the Kings Road in a trendy perfume and cosmetics shop and then, after work, I’d pitch up at my friends house (smelling amazing) and we would start getting ready for the night life. Sunday morning we would lie in and then, more often than not, we’d take ourselves off to Petticoat Lane market to spend our Saturday job money on new clothes. Sunday afternoon we would lounge about watching old black and white films on the T.V. being horrible about the actors before getting ready to go out on Sunday evening, arrive home at all hours and then be almost impossible to turf out of bed on Monday morning for school . Her parents must have had the patience of saints. God bless you June and Harold. I always sat at the back in French class on Monday so the teacher wouldn’t see that I was asleep. If only I’d known where I’d end up living. All this was done with my belongings packed in a carrier bag – usually a Sainsbury’s one although I must have purloined that from somewhere else as my Mum was more of a Tesco shopper then – and I can’t think now why I never had a proper overnight bag at any time during this period. Still, at least nobody could say I didn’t re-purpose before it was even fashionable. Which brings me, in an extremely roundabout, rambling and not even really relevant way, to this mini suitcase I’ve just made. Anyway, this is a pattern with slightly more to it than those little dogs, whales and stars that I bought – a doggy further down to jog your memory about that. It was fun to make but does involve a lot of interfacing. Each exterior piece has two layers of mediumweight interfacing plus a layer of fusible fleece. While the interior pieces have two layers of interfacing. The cutting out of all those is a bit of a chore but worth it for the strength and solid feel it gives the resulting case. The constructed exterior and interior turned inside out to show their interfacedness (made up word). 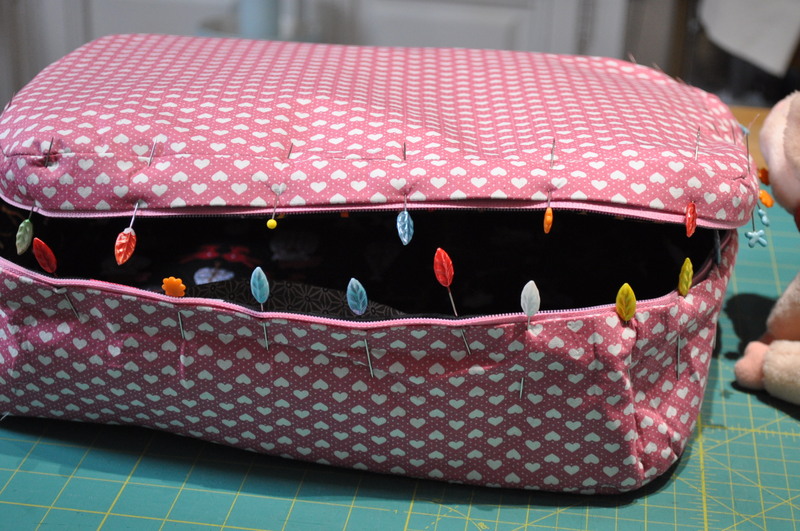 The lining is hand stitched in and, after I’d treated myself to an unexpected acupuncture session, I resolved to use those little pegs (aka wonder clips) next time instead of pins. It turned out much bigger than I was expecting and I think this would take a couple of sets of undies, some cosmetics, a toothbrush, a nightie and a (smaller) teddy very nicely. Much better than a carrier bag be it Sainsbury’s or Tescos. 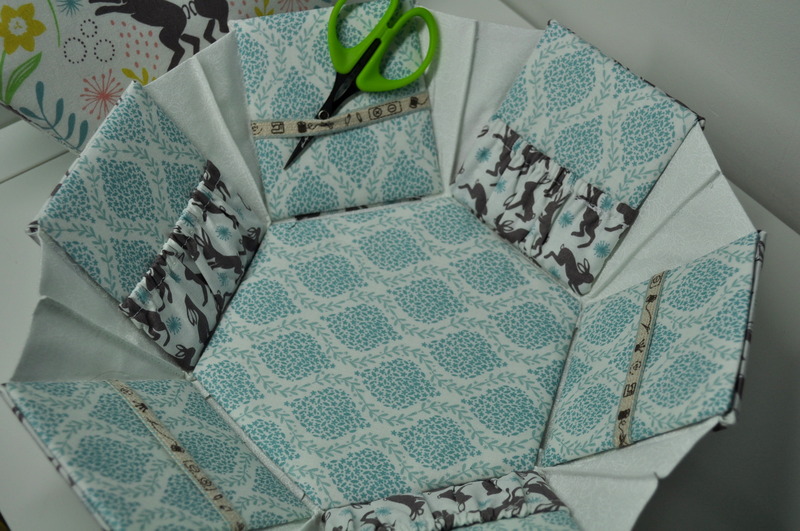 It would make a project bag with a bit of a difference or a very cute bag for a little girl (or a big girl) – which is why I have another on the cutting table as we speak. I have a Liberty fabric one in mind too which will come as no surprise to regular readers. 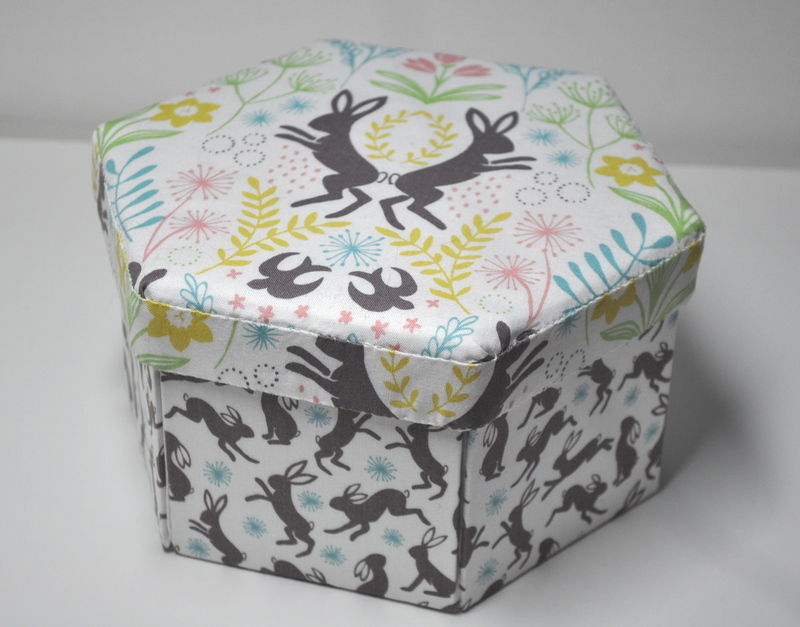 I’ve also made another ‘rabbit’ sewing box for my bunny loving client who commissioned another two for Christmas gifts. I’ve finished the first one and have the second one in production. The wildlife enthusiasts amongst you will notice that these are actually hares but I love this fabric so much and I thought she wouldn’t mind a bit of artistic license. I have promised to revert to bona fide rabbits for the second box. Talking of Christmas gifts – which I sort of was – don’t forget that Sheila over at Sewchet is obviously bonkers very kind and has decided to organise us again in another exciting Stitching Santa event this year. Whoopee! I don’t know what I like best – sending a parcel full of sewing related goodies (or knitting/crochet related if you prefer) to the recipient Sheila pairs me with or receiving a parcel myself. If you haven’t signed up yet and want to participate this year, there’s still time – just click on the image below and it will take you to where you can sign up. I sign up for the sewing and the knitting one because I like both and can’t choose – so I don’t. I am writing this at an ungodly hour of the morning because there were cats yowling outside from around 3.30 a.m. which caused our dogs to bark, which caused us to wake up and throw missiles out of the window which, as we thought to open the window first, caused a blast of frosty air to render us wide awake so we decided to give up the unequal struggle, get up and get on with things. I don’t know which cats were making all the racket but at least I know it wasn’t this one who, since turning up on our doorstep shortly before Christmas, rarely goes out and sleeps a lot, usually in a cute fashion. Leon relaxing after a hard day’s sleeping. Anyway, in case you started following my blog originally because you thought I was a fellow dressmaker but have since been regaled with cat and dog stories, knitting projects, patchwork blocks and various other random ramblings, I thought I’d reassure you that I do still occasionally turn my hand to clothing of the fabric variety. I suddenly remembered that Pippa over at ‘Beads and Barnacles’ had included a pattern in my ‘Stitching Santa’ parcel at Christmas for a very plain skirt so I thought I’d sweep the patchwork rulers and itsy bits of quilting fabric off my cutting table and finally make that fabric up into something wearable. I know I could probably have drafted such a simple shape myself but I’m too lazy I like to have a pattern to follow so I can blame somebody else if something goes wrong. I usually have a trawl around the web to see who else has made any sewing (or knitting) pattern I’m contemplating before I start so that I can benefit from other people’s mishaps and not make the same mistakes. I found that Beth over at After Dark Sewing had blogged about making this skirt and she had found the pattern piece for the waistband to be between one and two sizes too small. As I was squeezing the skirt out of a metre of fabric, I didn’t really want to have to cut a second waistband so that was useful to know in advance. The skirt has a back split which you can leave open or you can cut an extra pattern piece to get a sort of kick pleat effect, which I did. I shortened the skirt at the cutting stage by 3 inches but I still think it might look a bit ‘office wear’ for me (as I don’t work in an office) and, as others have said, the pattern doesn’t have you interface the waistband but I think – albeit belatedly! – it would be a good idea. So, what with those things and the fact it’s slightly big on me at the waist and hips, it might join my pile of ‘never worn dressmaking projects’ which is a shame as I do like it and, to celebrate the resuscitation of my dressmaking mojo, I had treated myself to these gorgeous pattern weights. However, as you can see, I am easily swayed from my purpose. Not something I’m going to be wearing! Despite having six cats and three dogs roaming around the place, we put up a large ‘real’ Christmas tree in one room and a smaller ‘artificial tree’ in another. They survived – relatively unscathed – until the new kitten (don’t ask) discovered he could shin up the centre of the artificial one creating havoc and mayhem among any food and drink stuffed, semi-comatose humans in the vicinity who were then forced to move at an unwelcome rate in order to prevent bauble breakage on a massive scale. I suppose he found it all very amusing as, once achieved, he repeated it ad nauseum until, last night, I got fed up and took it down. Having mulled (and drunk) enough red wine not to want to count the empty bottles, I decided to get up off my arse while still possible and hike up a small mountainside with the dogs. I made Mr. T. take a photo of me to show me wearing my hat that came in one of my Stitching Santa parcels. Despite the dark glasses and luminous dog harness I am not registered blind – just saying as I suddenly realised it might look like that. Stan’s harness actually says ‘Ball Junkie’ and not ‘Guide Dog’. Thanks to Sheila over at Sewchet who organised the Stitching Santa again this year, I received a lovely package from Pippa at Beads and Barnacles in the U.K. who got me as her sewing recipient. Ignore the clove stuck orange – she didn’t send me that – I was on the way to mull (yet more) wine when the photography urge came upon me. 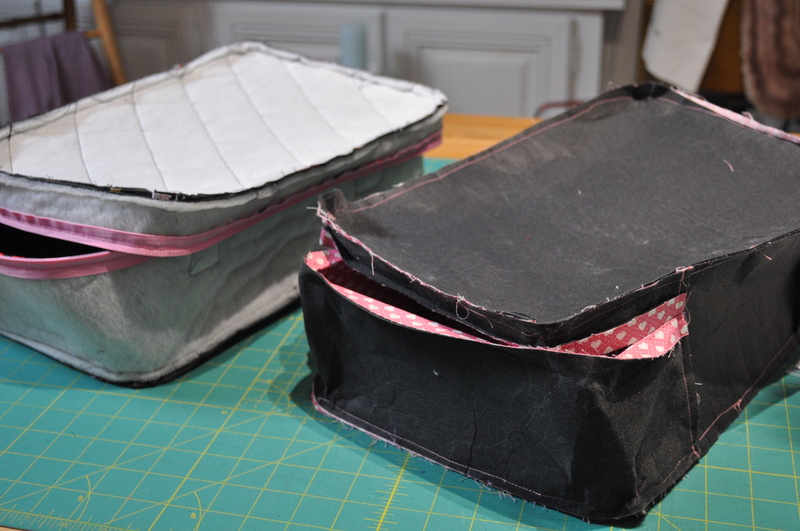 Pippa had made some very useful pouches and a bag for me to keep stuff in and even a length of bias binding she had made. Can you spot the blue fabric in the middle? I did take larger photos of it but the colour didn’t come out right so this is the best view of it. It is boiled wool jersey which I have never used before. Any tips or suggestions on what to make with it? Pippa suggested a sweater. I have 1.5m and it has a slight stretch to it. Also in the parcel was a useful pattern and one of her lovely knitted hats which I am modelling for you in the above dog walking picture just to prove to her that I will actually wear it – she seemed doubtful for some reason. As I’m a knitting person as well as a sewing one, I thought I’d go for the knitting Santa too and, just in the nick of time, a day or two before Christmas, my package from Anne in Australia arrived. Anne chose two lovely hanks of wool from Plant Craft Cottage in the Botanic Gardens in Melbourne where the yarn is hand dyed – these ones with eucalyptus leaves apparently – so I’m now looking for something to knit with them – there is 25g of each colour, it is 8 ply Australian wool, needle size 4mm and gauge 22st to 10cm. Any ideas knitting friends? Plus a lovely pencil drawing of a shell from Anne who is a talented nature and botanic artist so I’m very happy to have a little example of her work. I was chuffed to bits to receive all these generous gifts and thanks again to Sheila for organising us all. Sign me up again for next year!! Which was a shame because this was what was in the gift bag I’d handed her to put under her tree when I picked her up at her house earlier. A more successful gift was this satchel that Mr. Tialys made for a close friend of ours who spent Christmas Day with us this year. It is modelling for me on the bonnet/hood of her car as she was leaving the next morning with the bag stashed in her boot/trunk and I remembered I hadn’t recorded it for posterity and made her unpack it again. So, that is that for another year. I have made a couple of New Year’s resolutions but, after the disasters last year of my Firsty February (where I attempted not to drink any alcohol for a month and failed) and my Fabric Fast (which lasted 4 months instead of my pledged twelve) I will let you know what this year’s ones are if I actually manage to keep them and, if I don’t, nobody but me will be any the wiser. Have a brilliant 2017 and I hope everything you wish for comes true. Can I Mention the S Word? It’s October now – so can I say ‘Santa’? 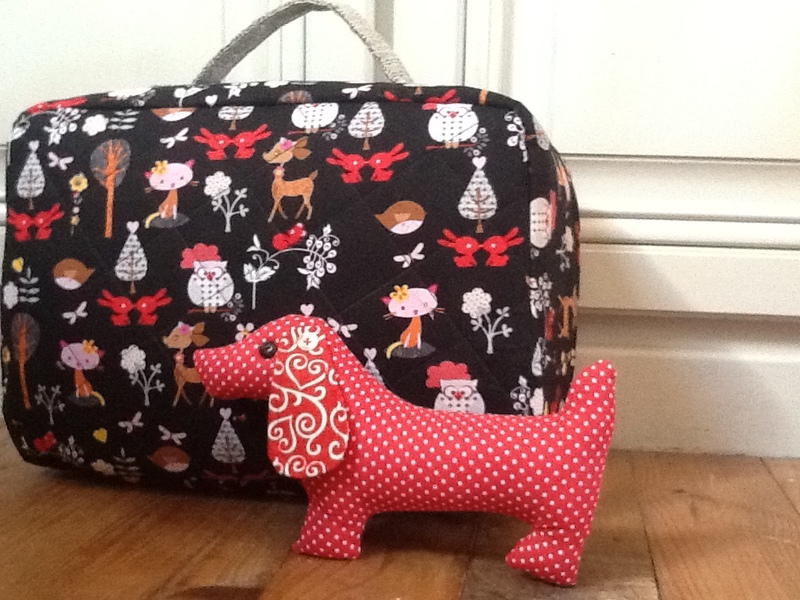 Do you have lots of friends and family who understand just what a sewing/knitting/crochet addict wants for Christmas? If you have, you’re lucky. I find it difficult to make a wish list for my family unless it’s very specific and then that spoils the surprise. 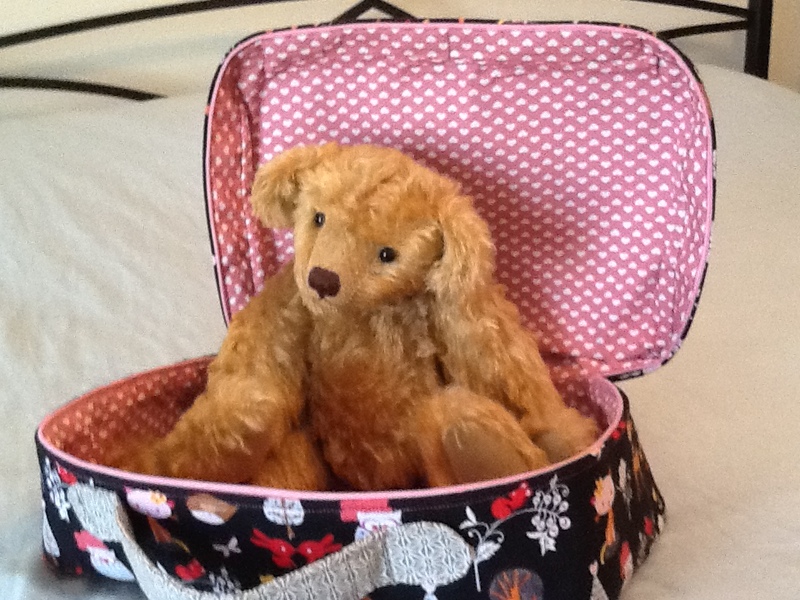 For the third year running, Sheila who blogs over at Sewchet, has the answer. She is organising Stitching Santa again . Sheila will partner you with somebody in your category – you can participate in the one for Knitting/Crochet or the one for Sewing – or you can enter both. I am! If you don’t already follow that person’s blog, it is a good idea to ‘blog stalk’ them to get an idea of their likes and dislikes and their taste in general. You send a parcel containing a gift costing no more than £10 (other currencies shown over at Sheila’s blog) and anything else you think your recipient would like such as little handmade gifts, accessories, notions, etc. You can enter from anywhere in the World and Sheila will try to match you up so the shipping costs aren’t too bad. I entered last year and it was great fun to choose gifts to include in the parcels and to have pressies under the tree that I knew would be themed especially for me and my sewing and knitting habits. Sorry, I think I put the ‘C’ word in there somewhere as well but there’s only about 84 sleeps left. This year I entered two secret santa type blog swaps kindly arranged by Sewchet. One was the Stitching Santa and the other (because I can’t have too much of a good thing) was the Knitting Santa. The idea is that you are paired with another blogger and, having read their blogs and sussed out their likes and interests as best you can, you make up a parcel of sewing (or knitting) related gifts for them to put under the tree to open on Christmas Day. If you have friends and family who don’t sew or knit, this is brilliant as you can be sure of getting some things from somebody who knows what another crafter would want. First to arrive – so early in fact, I had to hide it away in case I was tempted to tear it open – was my Stitching Santa gift. This came from Susanna over at Pins,Needles and Thread and the festive bag was full to bursting. Some really pretty handmade, fabric covered buttons …. A gorgeous little fabric hanging birdie who is swinging from my Christmas tree now…. and, as those of you who know about my year long Fabric Fast will appreciate, some very welcome fabric in various sizes suitable for patchwork and larger projects. I also have some gorgeous things to show you from my Knitting Santa which arrived on Boxing Day – not a public holiday in France so the postman could deliver it. Actually, it was nice to have an extra gift to unwrap the day after. However, it is my Mum and eldest daughter’s last day here before returning to the U.K. tomorrow so I’ll go and spend some more quality time with them and show you my gifts from SewingNikki in a couple of days time. This year I thought I’d enter for Sewchet’s Stitching Santa and, if that weren’t enough devilment for one day, I entered her Knitting Santa too. We are supposed to blog a bit about the goodies we have made for our secret swap partners and take little teaser photographs. However, I was in such a rush to get my parcels in the Christmas post that I completely forgot to photograph either the contents or the exteriors of the two packages I sent out . Well, you can’t get more secret than that!